I don't know what's going on but all my files on my external western digital 'My Book' are marked as 'READ ONLY'. I have tried formatting the My Book drive using File Explorer, but it tells me the drive is write protected. I have looked but there is no tab or switch on the USB drive to unlock or disable the write protect. I have also tried formatting the drive with Windows Disk Management but it fails. Also, if I right click the drive partition in Disk Management, the delete option is missing. I am at a complete loss. I have searched for 'wd my book read only remove write protect' in Google but I can't seem to find the answer. Can you please help? " I asked Larry if he would like me to connect to his system to have a closer look using my remote desktop support service, and he agreed. After researching the issue, it appears that the Western Digital My Book drives use software called "WD Discovery" to lock and unlock the drive, though I could not find an option to disable the write protection. From all the articles I came across, the write protect / read only issue appears to be a widespread problem that happens to users randomly, for no apparent reason. I came across a few posts that suggested third party 'usb unlock freeware utilities' could unlock the My Book drive, but this did not work. I also tried a registry fix to unlock usb write protected drives. After more research I discovered it is possible to unlock the partition using the 'diskpart' utility using the command line. Below I'll explain what I did to fix the issue. As I mentioned there is no write protect switch or tab on the device, so this means the My Book drive was write protected through software or firmware (though as I mentioned, I'm not sure how it was done in the first place). To remove the write protect, begin by launching an administrative command line; to do so: click Start, then type in "CMD" (no quotes); wait for "CMD.EXE" or "Command Prompt" to appear in the list, then right click and select "Run as Administrator". Click here to see a picture of everything I just said so it makes more sense. 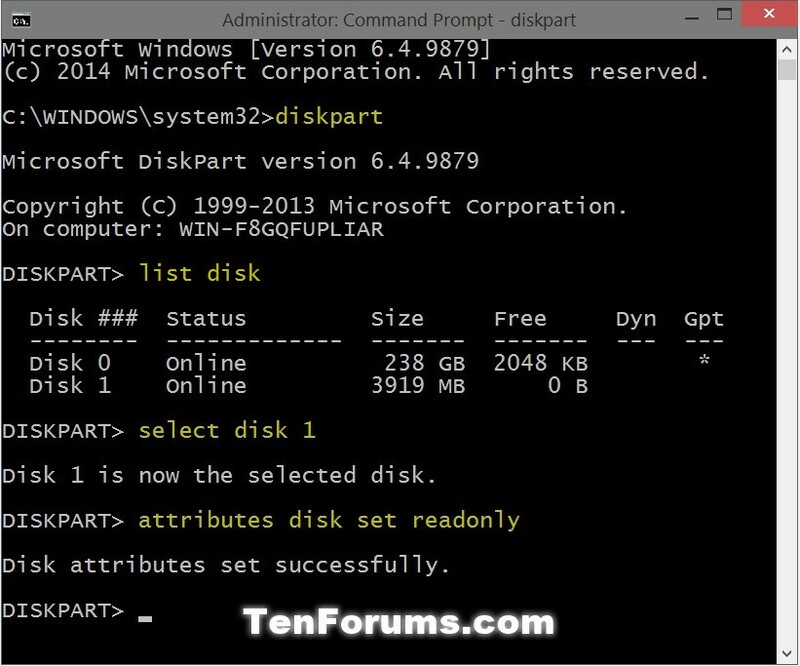 The 'diskpart' command launches the disk partitioning program via the command line; the "list disks" command then shows all disks attached to the system. 'Select disk X' tells diskpart to select the desired disk (the one which is write protected), where x is the disk number of the device; the 'attributes disk clear readonly' command removes the write protection from the drive that you selected using the 'select disk X' command. When complete, type in 'exit' to exit the diskpart utility. At this point you should be able to format the drive and/or erase files. Tip: if you are not sure which disk number you should be selecting you can also launch Disk Management to view disk numbers graphically rather than by the command line. To do so, click Start, then type in "diskmgmt.msc" (no quotes); wait for "diskmgmt.msc" or "Disk Management" to appear in the list and click it. When the Disk Management window appears, scroll through the list and look on the left side of the partition layout to determine which disk number is your My Book drive (the one that is write protected / read only). If all of this is over your head, or if you are still having issues unlocking a Western Digital My Book drive that has somehow made itself read only / with write protection, you are welcome to contact me for remote desktop support and I will fix it for you. Simply contact me, briefly describing the issue and I will get back to you as soon as possible.